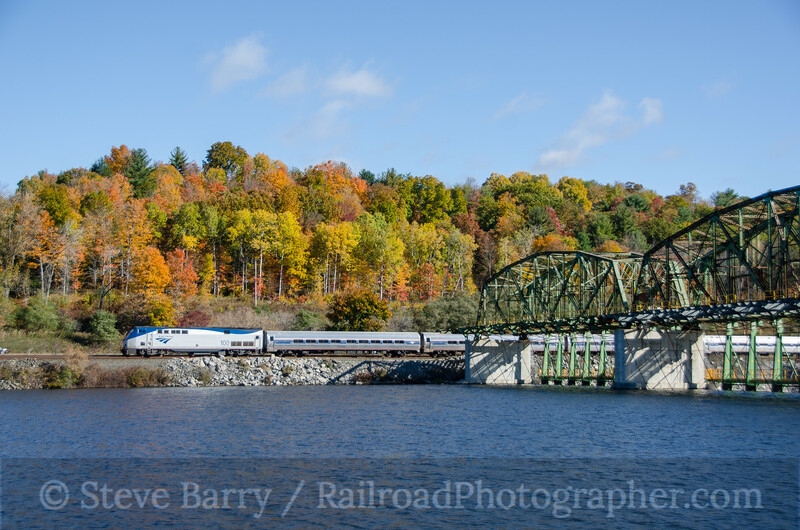 One of the most pleasant locations in the east to watch trains is in the middle of New York State, about halfway between Albany and Utica. 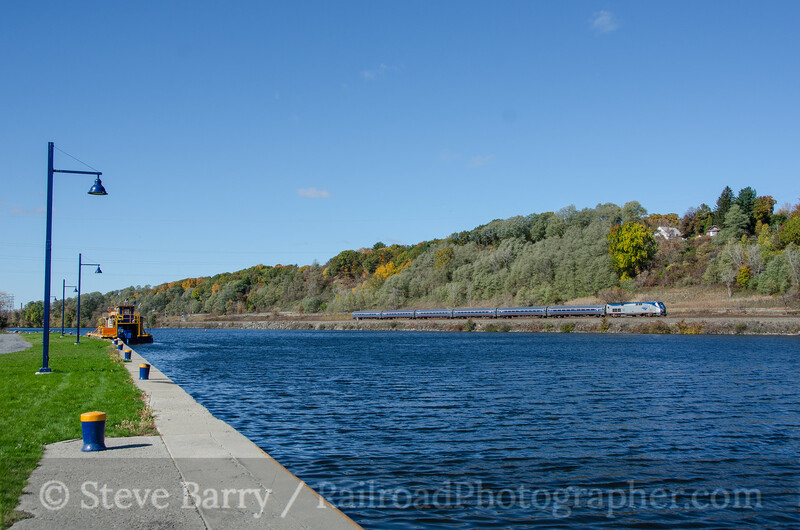 CSX tracks hug the north shore of the Mohawk River for much of run between the two cities, and just a couple of miles east of Amsterdam is Lock 10. The lock is located on the south side of the river, which is where the parking area is. 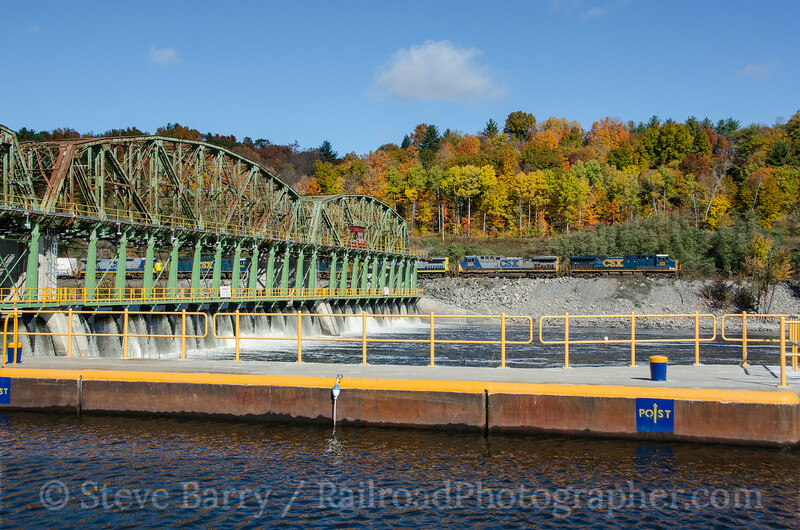 If any boats come by to use the lock, you have a front-row seat as they are raised or lowered to proceed further along the Mohawk. It should be noted that there are no shade trees here, and parking is out in the sun. If the weather is pleasant, you can unpack a sports chair and enjoy the sun and the breeze off the river. In hot or cold weather, you can take refuge in your car. If you have a radio scanner that picks up railroads, you will get plenty of warning for trains so you can get out of your car and set up. The signals at milepost 173 are just west of this location; there is a defect detector at milepost 177 that will give you a few minutes warning for trains coming east. Most trains also call all the signals on the line over the radio, so you'll hear approaching westbounds call the 169 and 171 signals as they approach you. The frequency you'll want to monitor is 160.800. 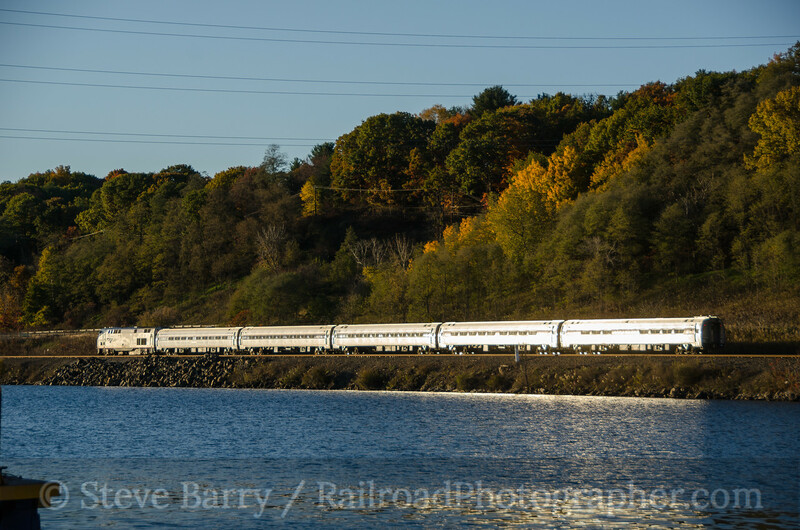 Fall is a good time to visit, as the weather is nice enough to be outside and the stand of trees behind the tracks turn awesome colors. You can wander around to get angles from both sides of the dam. The area is public access, so there is no problem with wandering around. Be aware that there are no railings along the river just west of the lock itself, so you'll need to keep an eye if you have kids with you. If you need necessities you can find convenience stores at the New York Thruway entrance just a couple of miles to the west. If you want food (more than convenience store food), you'll need to venture into Amsterdam, north of the Thruway entrance. The tracks hug the Mohawk into Amsterdam. The Amtrak depot is on the west end of town. The photo above was taken just east of the station. 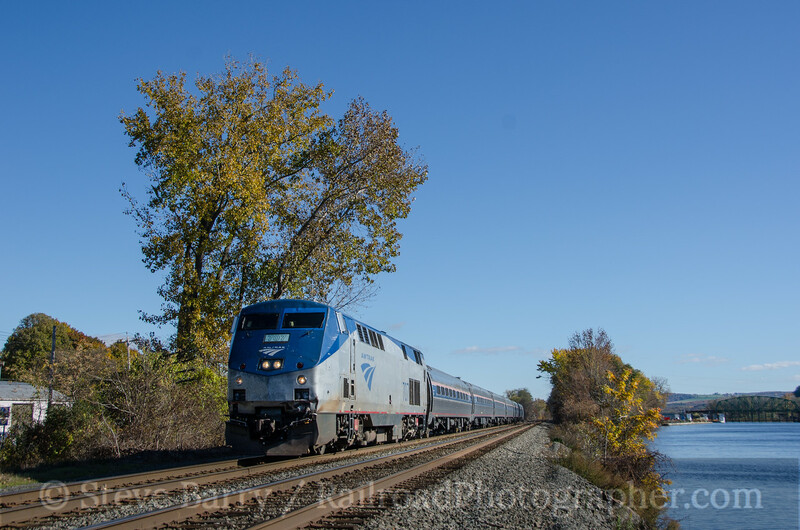 This railroad, currently owned by CSX Transportation, was once a part of the famed Water Level Route of the New York Central, so called because much of the line follows the Hudson and Mohawk Rivers as it leaves New York City; later, the route follows the shore of Lake Erie. This low-level route to Chicago was in contrast to rival Pennsylvania Railroad's New York-Chicago route that tackled the Allegheny Mountains further south. 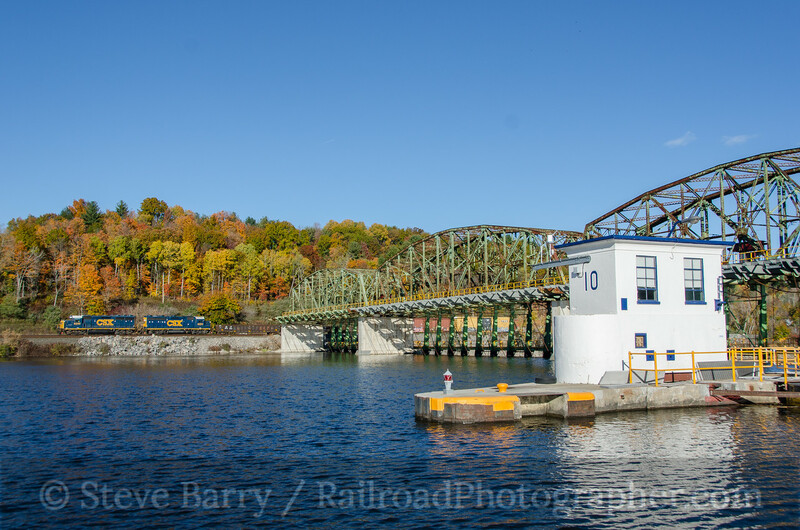 I spent the day at Lock 10 on October 23, 2015. Always up for a challenge, I decided to try some night photography. I set up three Alien Bees B800 studio strobes along the south bank and aimed them across the Mohawk. When I fired them, I couldn't really see any effect by just looking. But the secret to modern night photography is you need just enough photons for a digital camera to pick them up, and I was pleasantly surprised to see my camera was indeed finding the photons. 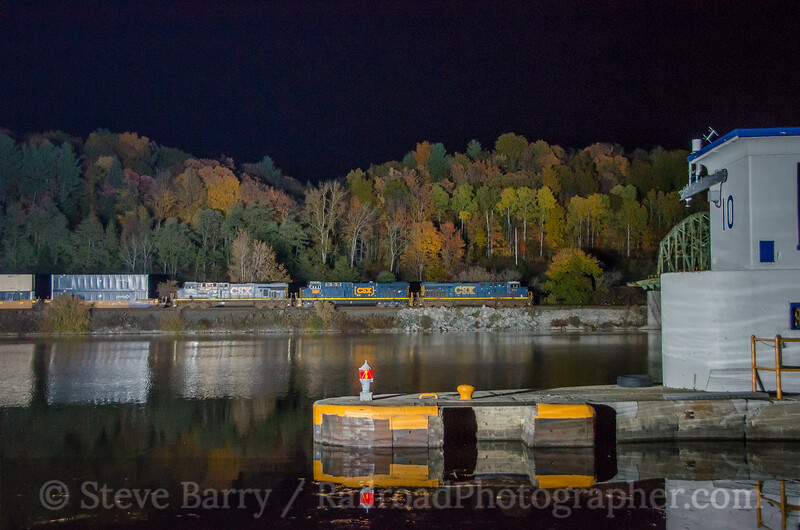 I finished off with a night scene of Amtrak's Lake Shore Limited, bound for Chicago, passing by. 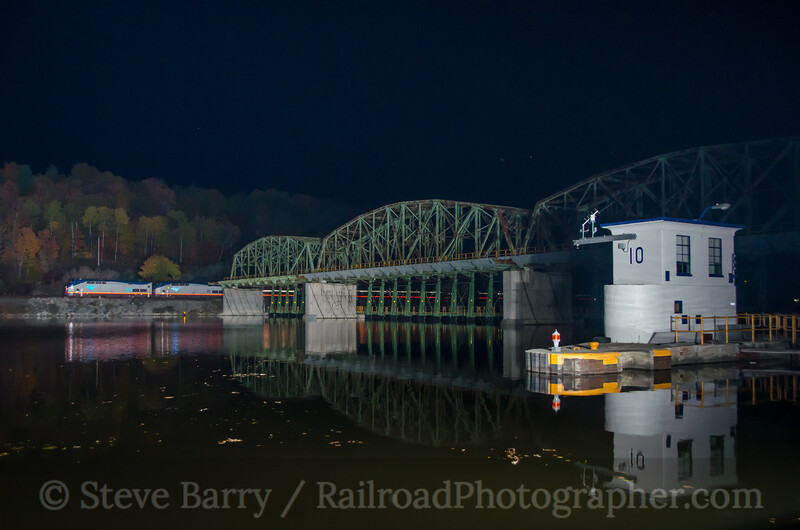 Consider a visit to Lock 10 -- it's a great place to watch trains.